Graham & Brown have come up with an lovely idea to help us parents give our children the bedrooms that they want and they've made it easy for us too. You can now buy a 'Room in a Box' which is a box that contains everything you'll need to decorate your childs room and it's available in several different designs. The Disney Cars room in a box is the ideal solution for any Disney Cars fan. 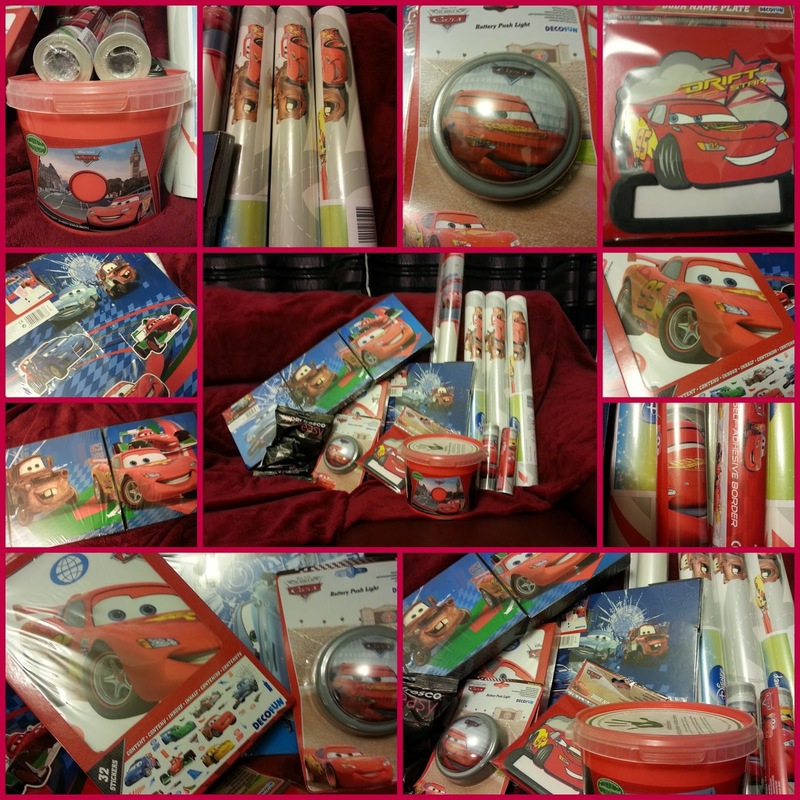 It has everything you need for creating a feature wall with the ‘Cars racetrack’ wallpaper and the co-ordinating accessories which include wall stickers and matching box art. It’s a great and easy way to decorate your children’s bedroom and with a fantastic saving of £37 if you were to buy the items individually. There are two different levels of box that you can buy: basic and premium. The Basic Box includes: 3 x Cars racetrack wallpaper 1 x paste 1 x Cars set of 3 box art 1 x Cars mini push light 1 x Cars foam door name plate 1 x Cars wall stickers. Premium Box includes: 3 x Cars racetrack wallpaper 2 x Cars border 1 x paste 1 x Cars Go Lightning paint 1 x Cars set of 3 box art 1 x Cars mini push light 1 x Cars foam door name plate 1 x Cars wall stickers 1 x Cars maxi sticker 1 x Cars magnetic canvas. 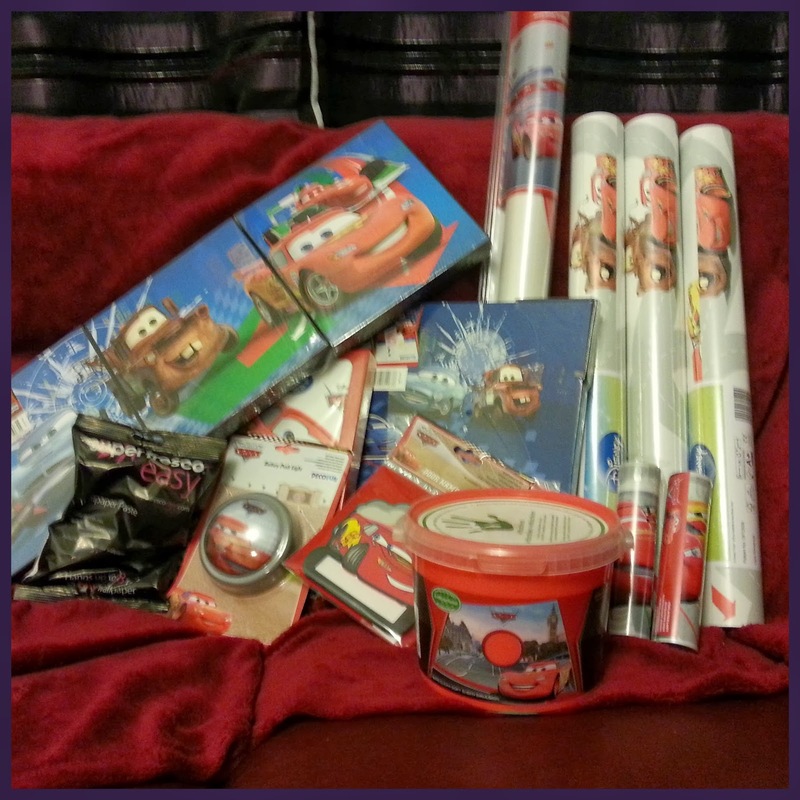 Last week we were sent a Premium Disney Cars Room in a Box for us to have a look at. My little man is currently sharing a room which makes it hard for us to decorate it with just him in mind so we decided to find an owner who would love it and need it. We've got some new neighbours who have two lovely little boys so I approached them to see if they needed any help decorating. They were overwhelmed by my offer but gratefully accepted it which I am so pleased about. There is now two little boys very excited about the new Disney Cars bedroom they will soon have. It might take a few weeks for me to show you their finished room so for now let me show you what you get in the box for your money while we wait. I was pleasantly surprised with the contents of the box, they really have thought of everything. 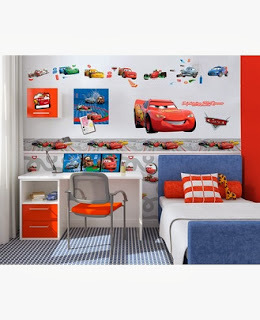 The wallpaper is bright and clearly printed with Disneys Cars characters the red paint makes a nice feature wall colour and the wall stickers look amazing. The little night light is a very nice added touch too, I'm sure any little Cars fan would love this for their own room. The Room in a Box is a wonderful idea, I'm very excited to see how my new neighbour's little boys room turns out. As soon as they've finished decorating it I will be able to show you all, I'm sure they will love it though. What's not to love? Be sure to look out for my follow up post which should be ready in a few short weeks hopefully. Ohh wow! That looks fantastic! What a great idea! !